we are ESPECIALLY happy to be able to offer this new module from Pete Hartman-- we are huge fans! 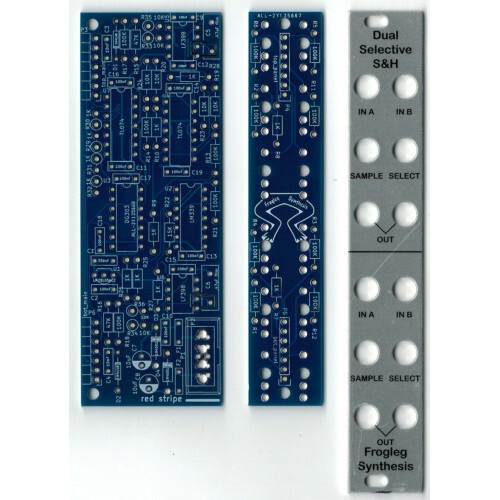 The Selective Sample & Hold is a new S&H based on the LF398 IC, but with a twist -- there are two inputs, and the Select input determines which one is sampled. With nothing in the Select input, it acts as a standard S&H on input A. The two output jacks are both the single sample, but separately buffered. You'll need to have to have an external signal to sample and an external clock/trigger to use it-- as well as a gate or other signal for the “select” input. The sample signal should be a relatively square waveform, but it is converted to a trigger pulse, so this will not act as a track & hold. Anything over about 1.5V with a sharp enough leading edge should cause a sample to be taken. The select input doesn’t need any particular edge, once it is over the threshold of the DG303 chip (about 4V) it will switch the signals so that B is being sampled by the S&H. Enjoy the introductory special of 10% off the PCB+panel set-- $22.50-- for the initial week of availability!